Identifying antique, collectible, and vintage furniture can be complicated. Although there are no simple tricks, one way to begin the identification is to become familiar with furniture labels and markings. Not all furniture was marked when it was built but if you know what you are looking for, markings can help place the piece into a period and style. Furniture labels and marks have been used since the 19th century, and the number of marks out there is mind-boggling -- in his book Arts and Crafts Shopmarks, author Bruce E. Johnson noted that more than 1,300 marks (or "shopmarks") were used from 1895 - 1940 by artists and furniture makers in the Arts & Crafts movement alone, and that doesn't include marks from the hundreds of other furniture makers. So, determining who made your furniture can take considerable time and research. The cabinetmaker with a shop often used paper labels or even metal tags with the shop name. These can be difficult to see, since the maker may have hidden them away from the finished surfaces. One snowshoe chair had the tag tucked under the chair's bentwood arm. The tag had darkened with age, and it wasn't until the chair was sent for repairs that the chair maker found the tag -- and realized the chair was made by his father 50 years earlier! The manufacturer which included large or regional furniture companies, such as the Old Hickory Furniture Company in Indiana. The retailer, who purchased showrooms full of furniture from factories somewhere else, but identified the furniture as "theirs." This happened most frequently with stores like Montgomery Ward or Sears, Roebuck & Company. Industry groups, such as the Mahogany Association, which promoted the use of certain woods. These label examples are from the 1930s when a new label was developed that did not peel off easily. Of course, forgers could use printed labels and identify less valuable furniture as made by a company with a sterling reputation. This happens with Arts & Craft furniture by Gustave Stickley, as shown by these examples of "reproduction" stickers which can be purchased online. It's clear that you have to be as familiar with the labels as you are with the furniture before you buy. Identify the age of your furniture. Is it 19th, or 20th century? Late Victorian, Art nouveau or Deco? There are many excellent furniture identification guides on the market which will help you locate your furniture in a time and place. Specialty guides to particular regions are also excellent resources, such as this book about the Grand Rapids furniture manufacturers. Use company archives for research. Some older firms, such as Old Hickory Furniture, have history and identification aids online. Some antiques dealers who specialize in a particular type of furniture have information on the web as with this Haywood Wakefield furniture. Locate old company catalogs. Sears, Roebuck and Montgomery Ward are among the most famous catalog companies, and they sold many furniture lines. Sears offers this guide to finding their older catalogs, and you may want to check with online auction sites. Auction houses, like Christie's, offer furniture identification guides online along with some suggested values, such as for American furniture. The inside or even the underside of drawers, a popular place for labels or burned in marks. A number could indicate the style, the maker, or even a patent granted to the company. The furniture back. Some manufacturers used less expensive wood on the back of a bureau, and they placed the label there, where it wouldn't damage the finish. The lower edges of furniture, especially on the side or back edges, where a metal tag might be attached. Arts and Crafts furniture makers and their marks can be found at Arts and Crafts Collector. Worthpoint has a Marks & Patterns library online, listing many furniture makers. Furniture expert and historian Fred Taylor lists and shows many furniture marks, including detailed close ups and placement. 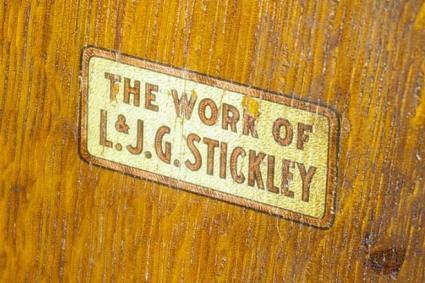 Stickley Era (roughly 1900 - 1915 in the US) furniture labels are detailed at this forum. Identifying furniture makers can be time-consuming and tedious, but the end result is the story. Knowing where your antique came from, who made it, and even why will add a new dimension to collecting and living with antiques.